Isn’t that great? Living on just cabbage soup for 7 days may sound so unappetizing. But, let me assure you that you do not have to eat cabbage soup alone. You can gorge on fruits, veggies, and proteins to keep your metabolism active and your taste buds alive. The next best thing about the cabbage soup diet is that it helps you stay active, energetic, and this diet is pocket-friendly. But remember, this diet plan is not recommended for long-term weight loss plans. In fact, following this diet continuously can weaken your immunity. In this article, we will discuss the 7-day diet plan, substitute foods, cabbage soup recipe, exercises to follow, and cabbage soup diet benefits. All you have to do is, scroll down. How To Prepare The Original Cabbage Soup Diet Weight Loss Recipe? 1. 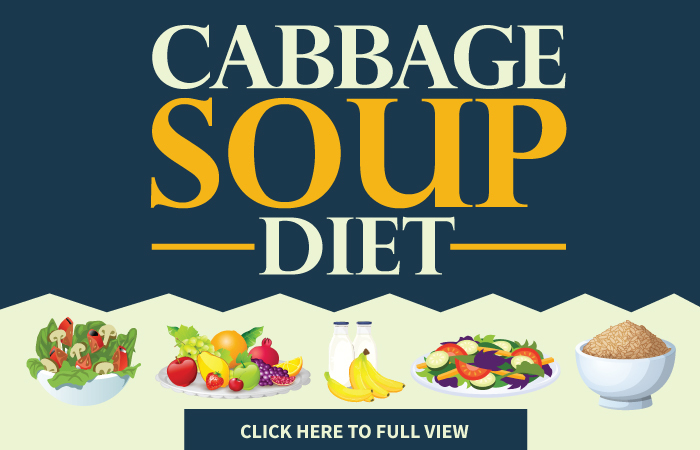 What Is Cabbage Soup Diet? The cabbage soup diet is a diet plan designed to cause short-term weight loss. This simple fad diet, along with half an hour of exercise, delivers better results than months of sweating through a regular weight loss program. So, does this diet actually work? Let’s find out! 2. How Does The Cabbage Soup Diet Work? The cabbage soup diet works by jump starting your body’s metabolism and fat mobilization. This diet restricts your calorie intake and forces your body to use fat as the energy source. Low sodium, low calories, and high fiber enable you to get in shape quicker than you would if you followed a moderate long-term eating plan. Cabbage soup is often prescribed to obese patients as the diet is high in fiber and low in calories (20 cal per 100 gm of soup). It provides more than 53% of the recommended dietary allowance every day. This is why the cabbage soup diet has successfully helped many people to lose weight. You too can lose weight by following the 7-day cabbage soup diet plan discussed below. 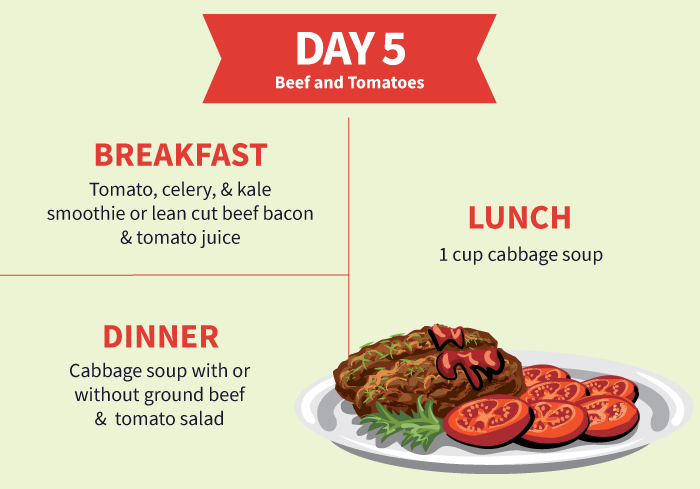 There are several versions of the cabbage soup diet plan that have been around for years. 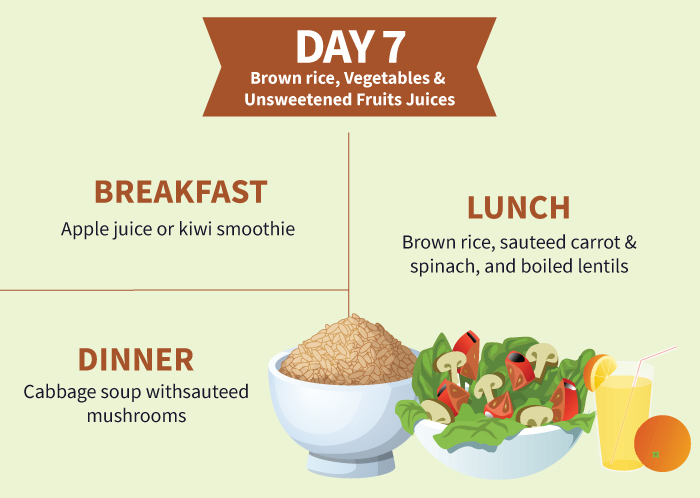 You need to follow a strict diet chart for the 7-day period. Cabbage soup is the main item, and it is complemented with other foods to fulfill the nutritional requirements. Fruits are a great source of vitamins and minerals. Along with it when you eat cabbage soup, you also get the vital nutrients from the veggies. Bananas are high in calories, hence, it is not recommended on Day 1. 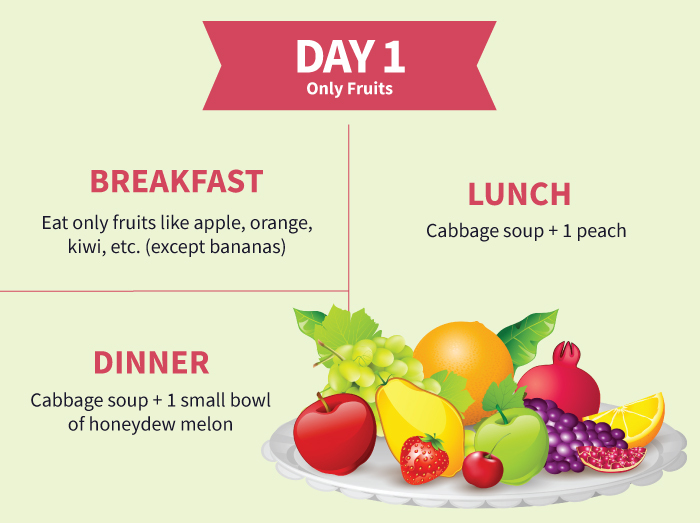 Cabbage soup and fruits diet is the perfect way to start your cabbage soup diet regimen. Warm water with lime juice is one of the best ways to start your day. It will help wash out the toxins and kick start your metabolism. Eat a lot of low glycemic index fruits on this day along with the cabbage soup. In fact, you can have cabbage soup as many times as you want throughout the day to keep your hunger pangs at bay. Fruits – Apple, peach, plum, guava, orange, nectarine, melon, watermelon, and kiwi. Vegetables – Cabbage, onion, leek, celery, carrot, spinach, and green beans. 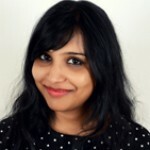 Fats & Oils – Olive oil, rice bran oil, hemp seed oil, flax seed oil, sunflower oil, sunflower butter, clarified butter (ghee), and peanut butter. Nuts & Seeds – Pumpkin seed, flax seed, melon seeds, almonds, walnuts, and hazelnuts. Herbs & Spices – Coriander leaves, parsley leaves, rosemary, thyme, dill, oregano, cardamom, black pepper, cayenne pepper, cinnamon, fenugreek seeds, cumin, saffron, garlic, ginger, turmeric powder, and bay leaf. Beverages – Green tea, black tea, black coffee, herbal tea, fresh fruit juice, and coconut water. Condiments – Homemade coriander leaf chutney with lemon and salt, homemade mint chutney with lemon and salt, and homemade yogurt dip without sugar. Fruits – Banana, mango, grapes, cherries, and papaya. Grains – All kinds of grains, including brown rice and oats. Fats & Oils – Lard, butter, mayonnaise, margarine, and vegetable oil. Beverages – Alcohol, packaged fruit juices, and packaged coconut water. Condiments – Tomato ketchup, chili sauce, soy sauce, mayonnaise dip, ranch dip, and tartar sauce. Do not eat too much or too many fruits at a time. Fruits contain sugar that can get converted to stored fat if it is not used as energy. Wash the fruits thoroughly before eating. If you opt for a fruit salad, choose fruits that will provide your body with different types of vitamins and minerals. Do not panic if you feel weak. It is just your body’s reaction to the low carb and low sugar diet. Drink enough water throughout the day. Start your day early and with a warm-up. Next, run on the treadmill or go to the nearby park. Take rest in between if you are not habituated to running. After completing your run, do 2 sets of 5 push-ups, 2 sets of 5 sit-ups, scissor legs, jumping jacks, rope jumping, stairs running, bench press, leg curls, and aerobics. End with stretching exercises. Make sure you get one hour of exercise on Day 1. Warning: People with heart conditions or any other condition that does not allow them to perform these exercises should consult their doctor or a fitness trainer to know the best workout plan for losing weight. By the end of Day 1, you are going to feel great about yourself as you will feel lighter. 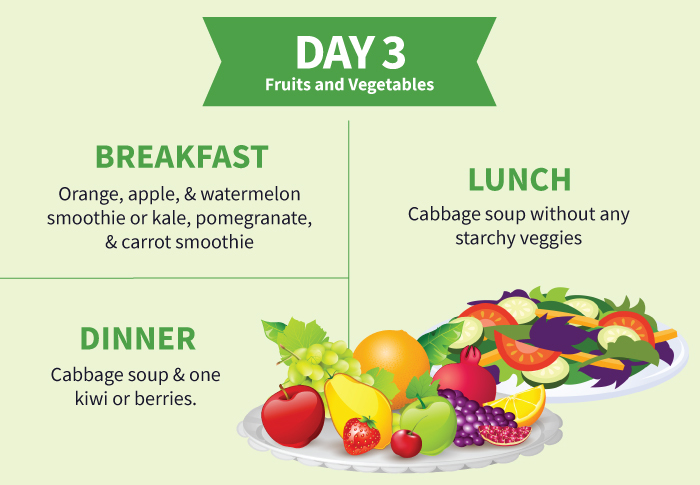 The nutrients from the fruits and the cabbage soup will keep your energy levels high throughout the day, and you will look forward to Day 2 of this diet. Without much ado, let’s see what Day 2 has in store for you. Welcome to Day 2. Start your second day by drinking green/black tea (with a dash of lime juice) or black coffee. Caffeine helps you lose weight, and the smell of the tea or coffee will kick start your day. For breakfast, have a vegetable smoothie to provide your body with nutrients that will help you mobilize fat. Have a bowl of cabbage soup with different kinds of green leafy veggies to feel full. If you feel hungry post lunch, snack on cucumber or carrots. Eat as many veggies as possible at every opportunity. For dinner, have a medium bowl of cabbage soup and some grilled veggies to break the monotony. Vegetables – Leek, celery, Chinese cabbage, cabbage, carrot, tomato, turnip, broccoli, green beans, kale, spinach, asparagus, beetroot, okra, and bottle gourd. Fruits – Avoid eating all fruits on this day. Grains – Avoid all kinds of grains, including brown rice and oats. Fats & Oils – Avocado, lard, butter, mayonnaise, safflower oil, corn oil, and cottonseed oil. Do not add sugar or artificial sweeteners to your tea or coffee as they can hinder your weight loss. Avoid eating starchy veggies. You may drink a cup of green tea or black coffee if you do not have the time to eat cucumber or carrots post lunch. Use olive oil to grill the veggies for dinner. If you do not like grilled veggies, you may have them sauteed. Start by warming up and stretching. Run on the treadmill or in the nearby park. On this day, focus on your abs. Do pushups – 2 sets of 10 reps, scissor kicks – 3 sets of 10 reps, air cycling – 2 sets of 10 reps, spiderman plank crunch – 2 sets of 10 reps, and bicycle crunch – 2 sets of 10 reps.
End by doing arm circles – 1 set of 10 reps (forward and backward), tricep push-ups – 2 sets of 5 reps, single chest press pulse – 1 set of 20 reps, inchworm, and shoulder press – 1 set of 5 reps. Circle your neck, and stretch your legs. Relax and rest for few minutes. Warning: People with heart conditions or any other condition should consult their doctor or a fitness trainer to know the best workout plan for losing weight. After the fruits day (Day 1), you will like having meals consisting of different kinds of veggies. It’s a great day to experiment. Prepare snacks and breakfast that include healthy portions of veggies. Since veggies contain a lot of dietary fiber, your gut health will improve. Now that Day 2 is over successfully, you will be prepared for Day 3 more than ever. Warm water with lemon juice and honey is the perfect way to start the third day as it will help flush out the toxins and boost immunity. Since this is a fruits and vegetables day, for breakfast, drink a glass of smoothie to activate your brain, muscles, and organs. Cabbage soup will make you feel full, keep your hunger pangs at bay, and provide you with a lot of fiber to mobilize the fat. You may feel a little hungry in the evening. Having a glass of fresh fruit juice will rejuvenate your body and provide energy. A small bowl of cabbage soup and a fruit for dinner will help your digestive system and help you sleep better. Vegetables – Leek, celery, Chinese cabbage, cabbage, carrot, tomato, turnip, broccoli, collard greens, radish greens, green beans, kale, spinach, asparagus, beetroot, okra, and bottle gourd. Fruits – Kiwi, watermelon, melon, plum, pomegranate, berries, and pineapple. Nuts & Seeds – Pumpkin seed, flax seed, melon seeds, almonds, peanuts, walnuts, macadamia nuts, and hazelnuts. Vegetables – Potato, sweet potato, and radish. Fruits – Mango, green grapes, black grapes, and pear. Grains – Avoid all kinds of grains. Fats & Oils – Lard, butter, margarine, mayonnaise, safflower oil, corn oil, and cottonseed oil. Do not eat high glycemic index fruits, or if you have them, eat a little. Also, avoid starchy foods. Spice up the cabbage soup by adding herbs or spices of your choice. Do not add condiments available in the market as they contain a lot of added sugar. This also holds true for packaged fruit juices, so it is better to make fresh fruit juice or eat a whole fruit. Start by stretching your legs, waist, shoulders, arms, and neck. Spot jog for 5-7 minutes. Squats – 1 set of 10 reps. Jumping squats – 1 set of 10 reps.
Cycling crunches- 2 sets of 10 reps.
Work on your abs by doing horizontal and vertical scissor kicks. Lie on your back and lift your legs at a 45-degree angle and count to 10. Do this 5 times. Rope jumping (1 set of 50 jumps). Push-ups – 2 sets of 10 reps.
Sit-ups and twists – 2 sets of 10 reps or 2 sets of 5 reps.
End by doing neck rotations, shoulder rotation, and face exercises (click here to view the different face exercises). You will love it when you see visible changes in your body by the end of Day 3. Veggies and fruits will help keep your hunger pangs at bay, and you will feel more conscious about your health. If you are used to binge eating, you might crave for junk food in the evening. Drink a glass of spiced up buttermilk to deal with the carb craving. Day 3 is successfully over. Now get ready for Day 4 if you really want to look fabulous. Green or black tea blends really well with lime juice and instantly makes you feel fresh and rejuvenated. You will eat at least two bananas on this day. Bananas are a good source of potassium, vitamin A, dietary fiber, and omega-3-fatty acids. Milk is a good source of calcium, vitamin D, potassium, good fats, and protein. Therefore, you will get all the essential nutrients for your body from banana and milk. You may include a small bowl of low-fat yogurt to support your digestion or a glass of warm milk with nutmeg to help you sleep better and wake up fresh the next morning. Vegetables – Leek, celery, Chinese cabbage, cabbage, carrot, tomato, turnip, broccoli, collard greens, radish greens, green beans, kale, spinach, bok choy, Brussels sprouts, asparagus, beetroot, okra, bitter gourd, and bottle gourd. Fruits – Banana, kiwi, melon, and apple. Dairy – Milk, soy milk, buttermilk, and low-fat yogurt. Nuts & Seeds – Pumpkin seed, flax seed, melon seeds, almonds, and hazelnuts. Herbs & Spices – Coriander leaves, nutmeg, parsley leaves, rosemary, thyme, dill, oregano, cardamom, black pepper, cayenne pepper, cinnamon, fenugreek seeds, cumin, saffron, garlic, ginger, turmeric powder, and bay leaf. Nuts And Seeds – Cashew nuts, walnuts, and macadamia nuts. Do not drink milk if you are lactose intolerant. Opt for soy milk. Add half a teaspoon of cocoa powder to your milkshake to break the monotony. You may also add flax seed powder. Shoulder rotations – 1 set of 10 reps (forward and backward). Arm circles – 1 set of 10 reps (forward and backward). Wrist rotation – 1 set of 10 reps (forward and backward). Neck rotations – 1 set of 10 reps (clockwise and anticlockwise). Jumping jacks – 2 sets of 20 reps.
Spot jogging – 5-7 minutes. Rope jumping – 1 set of 75 reps.
Running/Intermittent running – 10-20 minutes (take short breaks). Cycling – Instead of running, you can opt for cycling. Ride your bike for at least 20 minutes (take breaks if you need to catch your breath). Squats (1 set of 5 reps), crunches (1 set of 10 reps), and sit-ups (1 set of 5 reps) to improve blood circulation, fat loss, and bone strength. Warning: People with heart conditions or any other medical condition should consult their doctor or a fitness trainer to know the best workout plan for losing weight. Some of you may feel weak by the end of Day 4. 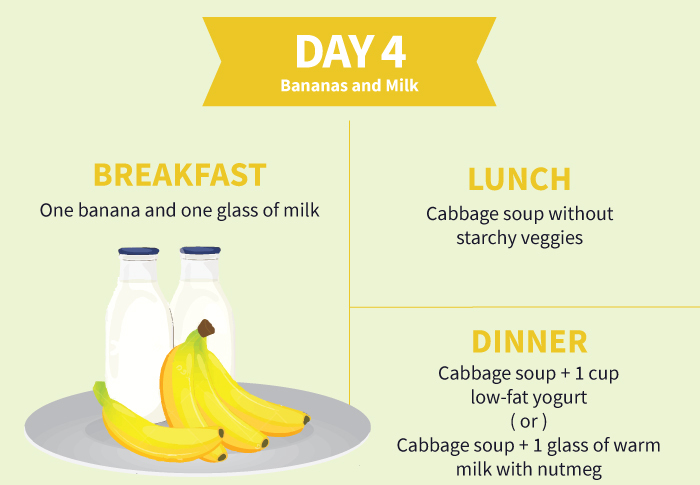 The monotony of milk, banana, and cabbage soup might make you feel bored with the diet plan. But when you check your body in the mirror, you will know that some hardships do pay off. Don’t give up. You have come a long way. A few more days to go to achieve your target weight. Let’s now get ready for one of the best days of this diet plan, Day 5. Starting your day with a glass of warm water and lime juice is a great way to boost metabolism and flush out the toxins. Have a nutrient-loaded breakfast with a smoothie or grilled beef bacon and tomato juice to help support your organs. Cabbage soup with non-starchy veggies will keep you active post lunch. If you feel hungry after two to three hours of lunch, have a glass of tomato smoothie to energize and rejuvenate yourself. Have a medium or small bowl of cabbage soup and a generous portion of ground beef to get the optimum protein to rebuild your muscles. Fruits – Avoid eating fruits on this day. Protein – Ground beef, ground turkey, chicken breast, salmon, mushroom, and legumes. Nuts &Seeds – Pumpkin seed, flax seed, melon seeds, almonds, and hazelnuts. Vegetables – Potato, green peas, sweet corn, and sweet potato. Nuts & Seeds – Cashew nuts, walnuts, and macadamia nuts. Beverages- Alcohol, packaged fruit juices, and packaged coconut water. Condiments- Tomato ketchup, chili sauce, soy sauce, mayonnaise dip, ranch dip, and tartar sauce. Always opt for lean cuts of beef. Do not consume tomato if you are not allowed to do so by your doctor due to medical reasons. Add a dash of lime and black salt to your post-lunch smoothie to enhance its taste and uplift your mood. Leg circles – 1 set of 5 reps for each leg (clockwise and anticlockwise). Pelvic circles – 1 set of 10 reps (clockwise and anticlockwise). Arm circles – 1 set of 10 reps (clockwise and anticlockwise). Wrist circles – 1 set of 10 reps (clockwise and anticlockwise). Shoulder and neck rotations – 1 set of 10 reps (clockwise and anticlockwise). Lunges – 2 sets of 5 reps.
Scissor kicks – 2 set of 10 reps.
Push-ups – 2 sets of 5 reps.
Tricep dips – 2 sets of 10 reps.
You are going to love Day 5 because it is a break from the same veggies and fruits. However, be careful about the portion size. Overeating on this day will impact your weight loss and performance. If followed properly, you will replenish the lost proteins and feel much more energetic than any other day on this diet. Let’s move on to the next day, Day 6, where you get to eat some more exciting foods. The morning detox water will help to balance the pH of your gut and facilitate bowel movement. The veggie smoothie will keep you full for longer and help in fat mobilization. Eat a medium portion of beef and cabbage soup to provide your body with the essential amino acids. A post lunch fresh fruit juice will curb your carb cravings. Well seasoned grilled beef chops and a medium bowl of cabbage soup will help your build body proteins and strengthen your muscles. If you are a vegetarian, opt for lentils, kidney beans, black-eyed peas, chickpeas, mushrooms, and tofu. Avoid using too much oil to grill the meat. Since you will be taking a lot of cabbage soup, you may experience bloating. Consult your doctor to avoid stomach cramps or unusual bowel movement. Thinly slice the apple and refrigerate the detox water overnight so that it is fortified with all the vitamins and minerals. By the end of Day 6, you will start to notice the improvement in your muscle structure and strength. Your body will look more toned than before. The pain from exercising will also reduce. So, one more day to go! Your determination and hard work will speak for you. Let’s see what is in store for you on Day 7. Cinnamon is an active weight loss ingredient. Have a cool fruit smoothie for breakfast to boost your immunity. Brown rice is more nutritious as compared to white rice. Have a small portion of brown rice with other veggies to have a nutritious lunch. You may feel hungry by evening. Snack on a fruit (except banana) to keep your calories down. Fortify the cabbage soup with protein-rich mushrooms to help build lean muscle mass. Fruits – Apple, kiwi, watermelon, honeydew melon, plum, orange, grapefruit, nectarine, and guava. Protein – Mushroom and legumes. Grains – Brown rice, oats, quinoa, and cracked wheat. Herbs & Spices- Coriander leaves, nutmeg, parsley leaves, rosemary, thyme, dill, oregano, cardamom, black pepper, cayenne pepper, cinnamon, fenugreek seeds, cumin, saffron, garlic, ginger, turmeric powder, and bay leaf. Beverages – Green tea, black tea, black coffee, cinnamon tea, herbal tea, fresh fruit juice, and fresh coconut water. Nuts & Seeds – Cashew nuts, walnuts, and macademia nuts. Stairs running or running – 5-10 minutes. Squat – 2 sets of 5 reps.
Crunches – 2 sets of 10 reps.
Pilates – hold for 15-20 seconds. ** Check the various fitness workouts here. I am sure you have noticed the difference. You have lost not only water weight but also fat, which is great as you look much slimmer and toned up now. You are much more active and positive in your outlook, which is one of the best benefits of exercising regularly and following the cabbage soup diet plan religiously. It is strictly not recommended to follow this diet plan beyond Day 7. Let’s see why in the next section. 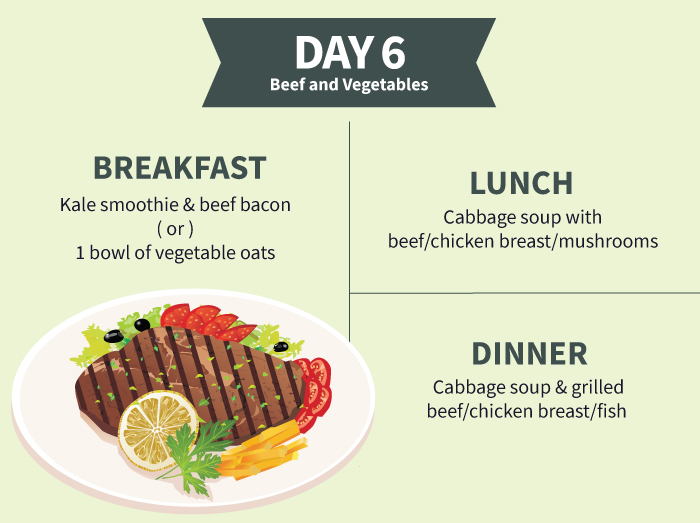 The cabbage soup diet plan should not be followed beyond Day 7 as it is a short-term weight loss program. Eating low calories for a long time will stall your body’s weight loss, and it will switch to the starvation mode. This can lead to weight gain. A break of a week or two will help break the monotony and will not allow your body to adapt to the low-calorie diet. It will also help you lose weight without losing interest in the diet plan. 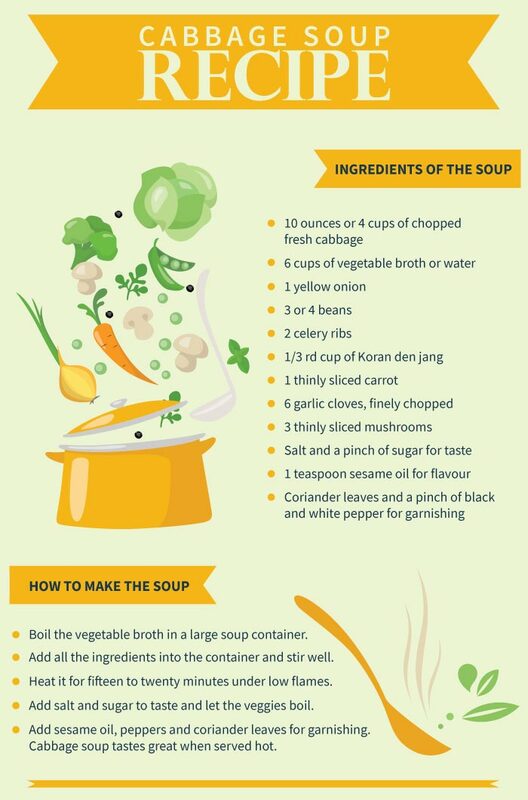 Keeping in mind your daily nutrient requirements, here is the recipe for the original cabbage soup. We have also provided a list of substitutes to help you modify the cabbage soup recipe. Make it delicious and enjoyable as per your taste. 4. How To Prepare The Original Cabbage Soup Diet Weight Loss Recipe? Preparing cabbage soup is easy. Here are the ingredients and directions. Heat it for 15-20 minutes on a low flame. Add salt and sugar to taste and let the veggies boil. Add sesame oil, peppers, and coriander leaves for garnishing. Serve hot. You may use red onions instead of yellow ones. You may use boiled shredded chicken instead of mushrooms. You may include vegetables like zucchini, spinach, and kale. You may add corn instead of sugar. You may also change the flavor and smell of the soup by adding different herbs such as bay leaves, parsley, dried thyme or basil leaves. You may use fish or chicken instead of beef in the diet plan. Instead of milk, you may drink soy milk. If you are craving for butter, use any butter spray available in the market instead of using butter for the soup. You may eat papaya, apricot or kiwi instead of banana. So, how exactly does cabbage soup help you lose weight? Here is the science behind this diet plan. Since the cabbage soup diet is low in calories, you tend to lose weight quickly. This plan also includes a good amount of protein, vitamins, and minerals that are essential for our body. Cabbage has anti-inflammatory and antioxidant properties. It lowers cholesterol and is good for the digestive system. Brown rice is a good source of vitamins B1 and B3, iron, and dietary fiber. Scientists have found that women who eat brown rice are much healthier and also weigh less (1), (2). Tomatoes are low in calories and fiber-rich. They also help fight cancer. Including tomatoes in this diet plan enriches the soup with nutrients and is a good kick for the taste buds. Milk is a good source of calcium, potassium, and vitamin D. It strengthens and supports your bones. Fruits and vegetables are rich in vitamins, minerals, polyphenolic flavonoids, and micro-nutrients. They will provide your body with nutrients and keep a check on fat accumulation. Beef is a good source of protein and has no carbohydrates. Loaded with vitamins, minerals, and proteins, beef helps improve muscle function and reduces fatigue. How else can you benefit from the cabbage soup diet? Let’s find out in the next section. The cabbage soup diet can cause rapid weight loss in a short span of time. By following this diet, you can lose up to 10 lbs in just 7 days. The proponents of this diet claim that it causes more weight loss in the same period as compared to other diets. However, it may vary from person to person. This diet is particularly suitable for those who want to lose weight fast. This diet enables you to have as much soup as you wish along with an unlimited amount of fruits or veggies as well as meat on specific days. You can even have baked potatoes. Hence, you are less likely to suffer from hunger pangs during the day. 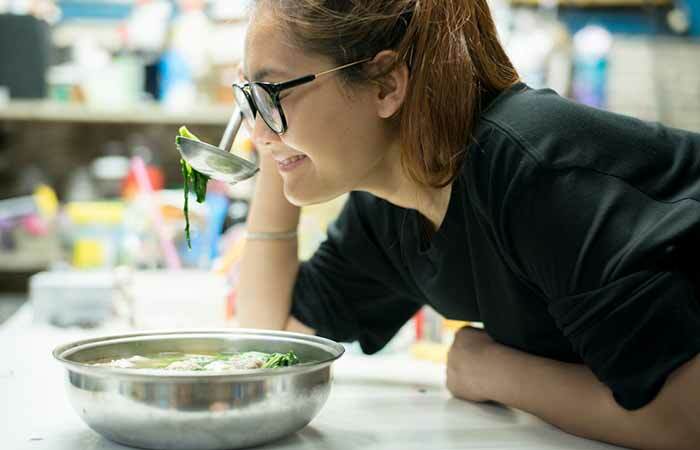 Initially, the cabbage soup diet might make you feel weak, light-headed, and tired because of the toxins and processed foods leaving your body. These effects vary individually, and eventually, they will subside. By the fourth day of the program, you will experience a significant increase in your energy levels. This diet ensures a healthy supply of nutrients and vitamins. It is centered around the cabbage soup, which is packed with healthy nutritious vegetables. You are also allowed to have unlimited fruits as well as meat. This can give your body a significant boost in vitamins. Tomatoes and other fruits, such as dark berries, are rich in antioxidants. The cabbage soup diet is relatively simple and inexpensive to follow. It does not involve complex meal plans or expensive dietary supplements. Exercise is not required. 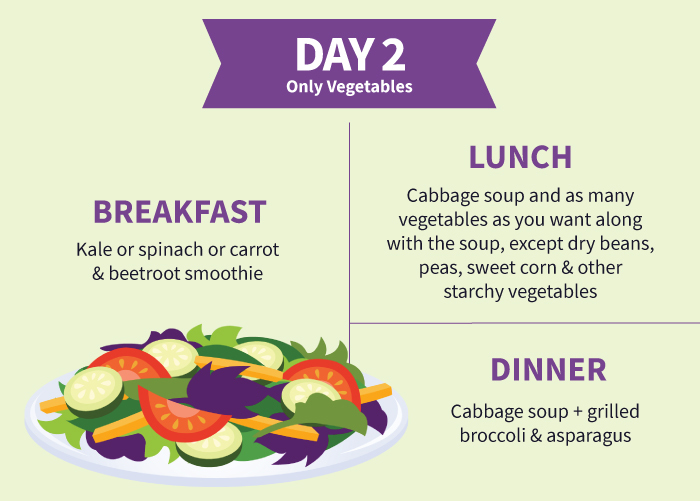 All you need to do is consume healthy fruits and vegetables along with cabbage soup during the seven-day period. Unlike other diets, it does not require long-term commitment. Thus, you not only feel great by losing weight and cleansing your body of toxins and processed foods but are also able to save money. In spite of the fact that the cabbage soup diet has yielded positive results in terms of weight loss, it is not recommended by health practitioners for more than a week. Like most fad diets, this diet is not without side effects, and you should be aware of them before following this diet plan. When you follow this diet, you are restricted to consuming cabbage soup and vegetables on a particular day. Healthy fats and complex carbs that are needed to satiate your appetite and keep you feeling full are excluded. Thus, you are most likely to feel hungry. While following the cabbage soup diet, you are most likely to experience flatulence. Excess consumption of cabbage and other vegetables like broccoli can cause gas and make you feel bloated. This diet involves a drastic reduction in caloric intake, which will cause your energy levels to drop and you might experience fatigue. Carbohydrates and healthy fats are your body’s sources of energy. The exclusion of these vital nutrients from your daily consumption can make you feel sleepy and lazy throughout the day. You might suffer from lack of energy to work out and for other activities. The main defect of the cabbage soup diet is that neither has it been set up in a nutritionally balanced way nor is it based on the proven principles of weight loss. It does not allow too much intake of proteins and carbohydrates. Hence, you are likely to suffer from nutritional deficiencies while following this diet. No wonder, it lasts for just seven days! Consumption of too much soup and water in this diet can cause you to urinate more than usual. Cabbage is a natural diuretic, which means that it promotes the secretion of water from your body. Other fruits and vegetables can also cause frequent urination as the natural produce is packed with water. Dizziness is another side effect of this diet. You might end up feeling light-headed due to the low intake of calories. The lack of carbs and fat in your diet can cause your body to get fatigued to the extent of fainting. This can only be cured by increasing the intake of calories. There is a lack of vital nutrients in the course of the diet. Hence, you are likely to become moody and irritable. Lack of proper nourishment for your body can make you suffer both physically and emotionally. Though you will succeed in losing weight, you might experience migraines, light-headedness, and mood swings in the course of the diet. Eventually, you become slower, which will affect your work. It is not a natural weight loss program since 90% of the weight lost is water weight and not fat. Not only is this unhealthy, but the extra fat held by your body before the diet will still be there. Since this diet is low in nutritional value, it will put your body in a state of starvation and energy saving mode, thus lowering metabolism and causing the reverse effect of actually gaining weight. Don’t get bogged down. The point here is to make it clear that this diet plan should not be followed continuously. Here are a few other points you should keep in might to get the most out of this diet plan. Include low glycemic index fruits and nutrient-dense vegetables when you are on this diet. Include a good protein source in the soup, such as mushrooms and lentils. Sleep well and let your brain relax. Drink fresh fruit juices without adding sugar. Stick to the workout routine. Relax, breathe, and rest in between the exercises. Do not skip the beef. It will provide your body with the protein it needs for better muscle function. You may feel weak if you don’t include beef. If not beef, eat fish or chicken. This diet is only for 7 days. Do not extend it. It will weaken your body and the immune system. Do not drink any carbonated or artificially sweetened beverages. Avoid adding any artificial sweeteners for these seven days. Do not use too much salt or too many spices to prepare the soup. Avoid avocado, dry fruits, pineapple, and mango. I am diabetic. Can I go for cabbage soup diet? Please consult your doctor first. The cabbage soup diet should be modified according to your medical condition. How much quantity of cabbage soup should be consumed every day? The soup should be the main component of the cabbage soup diet. You can take 2-3 bowls of this soup per day. How soon can I repeat the cabbage soup diet? Start after 2-3 weeks. This will give your body a break from the low-calorie diet and rejuvenate you. I am 17. Can I go on a cabbage soup diet? You are still growing and need more nutrition and energy. Check with your doctor for the best way to follow this diet. Can I eat bananas for all the 7 days? Banana is high in fruit sugar, carbs, and starch. Hence, it is best that you don’t eat it every day while on this diet. I am feeling weak, getting headaches and cannot sleep at night. Should I stop the cabbage soup diet? As this diet is a low-calorie diet, if you don’t take enough protein, you will start to feel weak. This weakness leads to other problems such as headache and insomnia. Try to eat boiled egg whites, boiled chicken or boiled mung beans (moong dal). Do not workout. I am feeling bloated and constipated. What shall I do? Drink more water if you are feeling constipated. Gentle exercise will also help you. You may take gas-relieving pills after consulting your doctor. I don’t seem to lose any weight even after following the diet strictly. Avoid sugar and spices, put less salt in your soup, drink more water, and do not use butter (see 5th point).